On the list of least-favorite household chores, we’re guessing that doing laundry lands somewhere in the top five. And if you have a large family, it’s one of those tasks that never seems to end. Over the years, Real Simple editors have written countless magazine articles and online posts focused on tips to make this tough chore a little more manageable. From a product that cuts down on dryer time, to a method for getting it all done in small chunks of time, here are 6 of our favorite ways to make laundry easier and faster. Nothing groundbreaking here, just little tricks and simple swaps to step up your laundry routine. On the list of least-favorite household chores, we’re guessing that doing laundry lands somewhere in the top five. And if you have a large family, it’s one of those tasks that never seems to end. Over the years, Real Simple editors have written countless magazine articles and online posts focused on tips to make this tough chore a little more manageable. 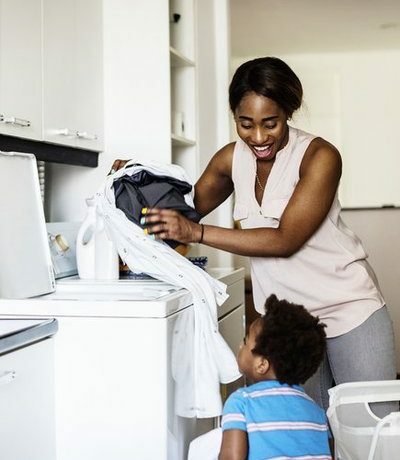 From a product that cuts down on dryer time, to a method for getting it all done in small chunks of time, here are 6 of our favorite ways to make laundry easier and faster. Nothing groundbreaking here, just little tricks and simple swaps to step up your laundry routine. If it seems like it takes forever for your bath towels to dry, invest in a set of wool dryer balls. When added to a load of laundry in the dryer, they will not only help clothing dry more quickly, but also reduce wrinkles and static cling. Bonus: Add a few drops of essential oil and they’ll impart your laundry with a fresh scent. This “sleeper hit” has become so popular, it’s a struggle to keep them in stock before they sell out (again!). What’s your least favorite part of doing laundry? If you said folding the clothes, then this gadget’s for you. Place t-shirts, pants, or sweaters onto the board, then flip the sides to fold the garment into a neat rectangle. Your least favorite chore just got much easier. Laundry baskets can be big and bulky, even when they’re empty. This clever collapsible option folds down so it’s just 3 inches wide when not in use, making it easier to carry and stow away. If you have clothing that’s only been worn once or twice and isn’t stained, opt for the light setting on your washing machine, which lasts just 6 to 8 minutes. Mary Zeitler, a home economist at the Whirlpool Institute of Fabric Science, recommended this tip years ago, and it’s stuck with us ever since. Don’t waste time hunting for missing socks in the dryer. Instead, grab a couple spacious laundry bags and group all of your socks together. When it’s time to fold your clean laundry, it will be easier to match up each pair, and static cling won’t cause spare socks to cling to your pants or bath towels. If you’re tackling multiple loads of laundry at one time, it can take all weekend to complete. Rather than ruin your weekend, break the task up into chunks of time during the week, suggests Cathy Bloch, a mother of three in Bronson, Michigan. Dedicate one day to washing sheets, another to light clothing, or if you have several children, do one kid’s laundry each day. By the time Sunday rolls around, you’ll be ready to relax.